Food. Fashion. Home. : What did you do this weekend? Do you ever feel that if you aren’t doing projects over the weekend, that you didn’t do anything? We constantly struggle with this. If we aren’t traveling or have events over the weekend, we both feel the need to constant being doing things around the house. No, it really isn’t a problem, but we need to get in the mindset that it is ok to relax a bit and not actually get a project done. That wasn’t the case this weekend because we did get some things done, but also had some time to enjoy the warmer weather and spent some relaxing time together. Normally on the weekends one usually makes more complicated dishes because there is more time. I just wasn’t in the mood. I made some of my easier dishes like the marinated edemame to go with some pot stickers for one meal and then a quick warm kale salad for a light dinner on Sunday. That warm kale salad has become a staple dish about two times a week lately. I have been keeping up with my New Year’s Resolution to drink more water. The aquazinger it awesome! The fact that I’m not sucking up lemon pits when I drink my water has made the whole process easier. 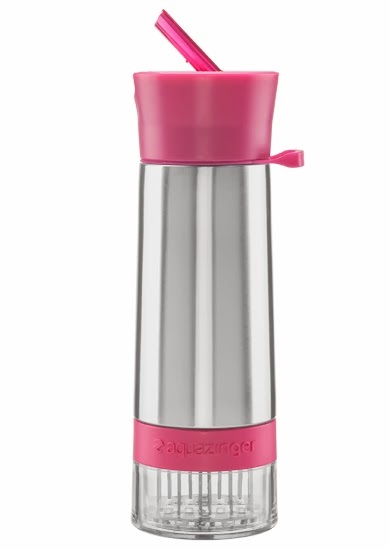 I love the fact that the bottle is dishwasher safe, because things do not get washed by hand in this house unless absolutely mandatory, it just takes too much time. I also love the fact that I get a few uses out of the fruit or veggies you put on the bottom. My favorite for sure has been lemon and cucumber. The bottle came with an ingredients ideas and recipes that have different veggies, fruits, herbs, spices, even sugars. I think I will try the citrus cilantro this week. I received something in the mail on Friday when I got home and I haven’t been so excited about a delivery like that in a while. 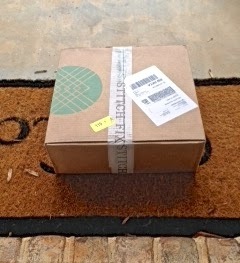 My first Stitch Fix order was delivered. I knew it was coming because they had sent me an email letting me know it was on its way. There are little surprises left in life anymore and this clearly was one of them. I was so giddy to open that box and see what “my stylist” had chosen for me. Inside was a fit and flare dress that was cobalt and blue, owl print button-up cotton cardigan, two short sleeve shirts (chevron and solid/striped arms), and a printed ¾ sleeve blouse. Inside the box were picture cards with each item for a day look and a night look. I tried all the items on and really thought about outfits to put together with them. In the end, I returned all of the items. TEAR!!! The dress was a little bit big for me, but I have something similar so it wasn’t worth exchanging, even though I usually love anything in cobalt blue. The cardigan was exactly my style minus the owls. I just don’t do clothing with animals on it, animal prints are ok, not animals. The t-shirts were great, but for $48 each, this frugal gal just won't allow that. My biggest upset was the ¾ sleeve blouse. It was super cute and exactly what my style, but I also like to raise my arms in the air without tearing the back. I have a larger back and this blouse had no stretch. Going up a size would have been too large so it had to go back too. So the Debbie Downer part of this story is that I had to return my stuff, but the upside is that in February the 11th to be exact, I will get my next order and the surprise factor will return again. There is always a project to keep me busy. I did a lot of odds and ends things this weekend; sewing, cleaning, organizing, and small projects. I made another slipcover for a pillow. I didn't think I had enough of the navy chevron fabric, but it worked out perfectly. While I had the sewing machine out, I also sewed a few items that needed a stitch. After reading a post for YHL, I got the idea that we needed to renew the grout in our bathrooms. Jeff was the logical one and suggested just using some bleach and a toothbrush; he is so smart. Our house is only a few years old and therefore the renewal wasn't needed. No need to purchase and spend more time than needed. A little elbow grease and about an hour and it was done. It looks like a whole new floor. I also made some wall art for our master bathroom that I will be posting later on this week. The project was extremely simple and took only a few minutes. More to come. What did you get done this weekend? If you said nothing, then I'm a bit envious. Labels: Cleaning., Decor., Food., Health.